I am not the type of girl that just orders a salad every time we go out. I used to be that girl, but that was when I used to be over concerned about my thighs touching. No more. If I’m hungry, give me a burger. Half burger, half ketchup, that is, with tons o’ fries. Then I’m a happy patron. But I’m not always big on meat. I mean, have you ever eaten a burger and then felt like you needed a 5 hour nap just to recover? Yeah, that’s me. In my quest to find the perfect veggie burger I’ve tried quite a few but never quite felt like I’d found “the one.” That had to change. Friends, I’m happy to report that these little gems not only require just 7 ingredients, but they also hit the nail on the head with both flavor and texture. Serious score. The base starts with onion and mushroom, sautéed to deepen their color, flavor and texture. Then I added in a light seasoning of salt, pepper and chili powder (or cumin). Then came the mashed beans – I went with kidney to try something different than black beans, which is the legume most veggie burgers rely on. Last but not least, ground walnuts and cooked quinoa for a “dry” that not only creates a lovely crumbly texture, but also adds heaps of nutritional benefits. I’m happy to report that both worked! The baking takes longer but yields a better overall texture, I believe. But if you’re in a time crunch, throw them on the stovetop! They’ll do just fine. I had one for sampling purposes, then another…The rest are just waiting to be devoured. These won’t last long around my house or yours. 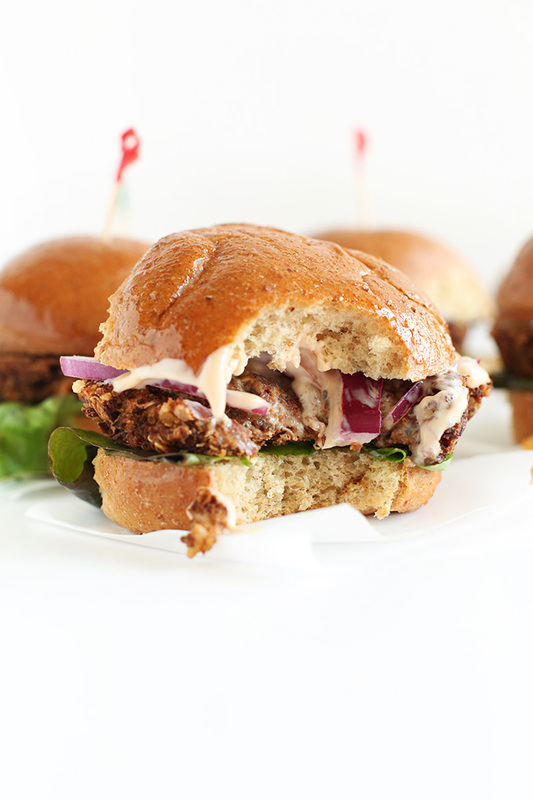 This recipe yields about 10 thicker baked sliders or 16 thinner “grilled” sliders. So one batch will feed a descent-sized crowd! But if it’s just you and a friend, I’d suggest par-baking them for maybe 15 minutes and then pulling them out to freeze. Then, when you’re ready to eat one, just pop it out of the freezer and bake until warmed through and adequately browned and no longer tender. All that’s left to do is top as desired. I went with ketchup, mustard, lettuce, onion, tomato. But I’m someone of a hamburger purist, so do as you wish! I’m sure these would be awesome with avocado and salsa for more of a Mexican spin, or with cheese (vegan or not) and some vegan bacon. Dream big and eat several – they are sliders after all. Enjoy! 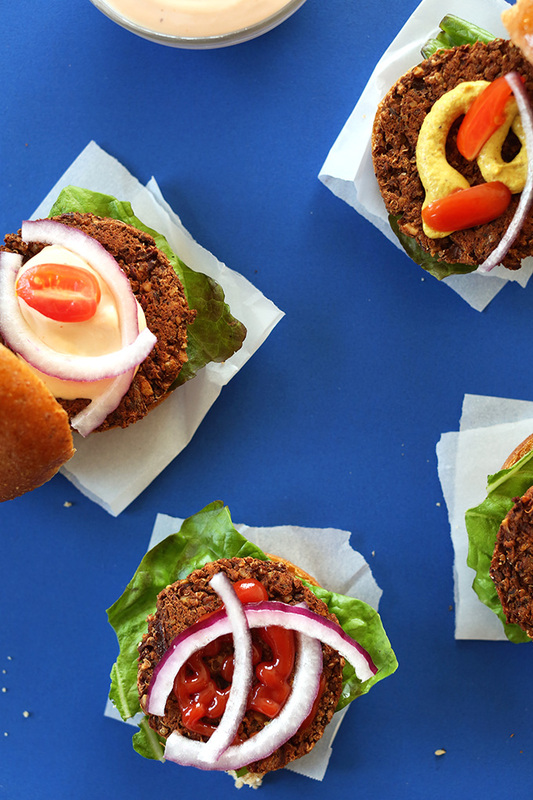 7-ingredient smoky veggie sliders that are gluten-free, vegan, and perfectly tender and crumbly. Make the whole batch for a crowd, or par-bake half, freeze, and save them for later. Heat a large skillet over medium-low heat and add some nonstick spray or add a bit of olive oil. When hot, add the onion and slowly sauté, seasoning with a pinch each salt and pepper. Remove from heat and add beans and mash. You’re looking for a rough mash, not to turn it into a paste, so you can leave some whole or halved if you want. Taste and add another pinch of salt, or pepper if needed. Transfer the mixture to a mixing bowl, add the quinoa, chili powder or cumin and stir. 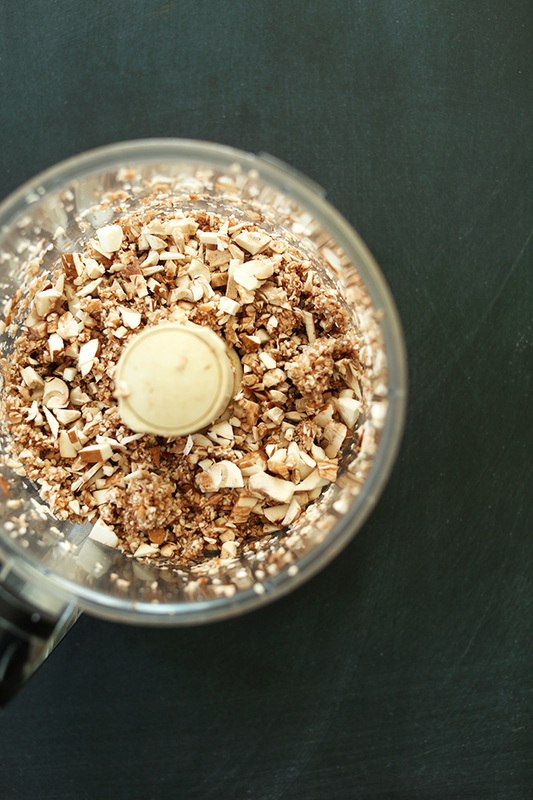 Lastly, add the walnuts a little at a time until the mixture is thick and malleable enough to form into patties. Pop in the fridge for 10-15 minutes to cool and preheat your oven to 375 degrees F (190 C). Coat a baking sheet with nonstick spray or olive oil. Once chilled, form into small patties. I love using a peanut butter jar lid lined with plastic wrap to get the perfect, mess-free shape (a tip I learned from Iowa Girl Eats). See photo. Arrange on the baking sheet and brush or spray the tops with olive oil and another pinch of black pepper and any leftover crushed walnuts (optional). Bake for a total of 40-45 minutes, flipping around the 20-minute mark. Cook longer to dry them out even more and achieve more crisp, but it’s not necessary. For a quicker option, form into thinner patties (1/4 inch) and brown in a saucepan over medium to medium-high heat lightly coated with olive oil. Cook until brown on both sides – 3-4 minutes on each side. However, this version doesn’t get them as well done in the middle. 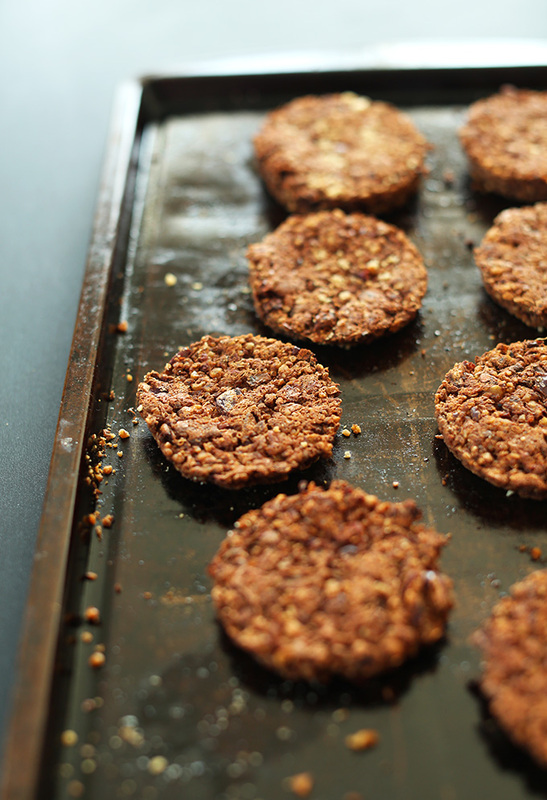 If you don’t want to cook the whole batch at once, form into 10 thicker patties (as original recipe is written), par-bake them at 375 for 15-20 minutes. Then cool and stack between layers of parchment paper and cover. Freeze for up to a few weeks. To cook, bake as instructed until desired texture/color is reached. What kind of slider buns did you use? store bought or did you make your own?? I am making these for my daughters bday party this weekend! We just used store bought for this recipe, but you could definitely make your own! Made bite sized versions of these with black beans just yesterday using my smallest biscuit form (about 1.5 inches) and that plastic wrap trick. Baked for 20 mins total, and topped with a dash of Cholula, a slice of cherry tomato, and a tiny wedge of avocado. They looked so cute on the platter and my vegans were delighted. Thanks! Yay! That sounds delicious, Catherine! Glad you enjoyed! As a massive carnivore, but who loves to cook for and accommodate anyone who likes food, regardless of views, I’ve up until this point pretty much given up on the idea that burgers could be replicated without meat. This right here is awesome! The texture is great, flavor is really nice and with a good amount of seasoning it all comes together, so thank you for this! I made them for a birthday party (tonight) though had a taste. I am 100% sure they will be a massive hit! Hi Dana. I’m literally in the process of making these burgers right now and followed your directions to a tee. After 20 minutes in the oven and going to flip the burgers, they completely fell apart. 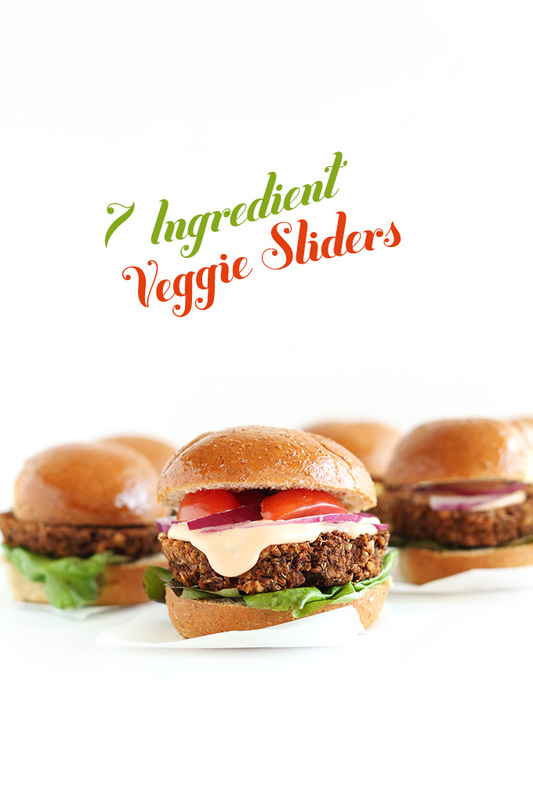 I’ve made a lot of veggie burgers in my day but these definitely need some assistance. Perhaps next time i’ll try adding flax or oats as a binder or try pan frying instead. Any thoughts? Can I sub brown rice for the quinoa? I just made these for my newly minted vegetarian teenager, and they came out tasty but a little bit crumbly. I think I may have used too many walnuts, or not enough mushrooms (I only had half a portobello and 1 lonely white mushroom in my fridge). I also used 1/2 T. cumin and 1/2 T. chili powder. Nevertheless, they were delicious, and they passed the test with my daughter who used to LOVE cheeseburger sliders before watching “Food, Inc.” So I made half carnivore ones for my other teens, and half veggie ones for her, using homemade slider buns and topping with cheese and ketchup. Thank you!!!!! Hi Gina! Yes, that should work! Love your recipes! Was just wondering if these freeze well and if so, would you freeze them before or after they are cooked. Hi Marni! Parbake them at 375 for 15-20 minutes. Then cool and stack between layers of parchment paper and cover. Freeze for up to a few weeks. To cook, bake as instructed until desired texture/color is reached. Good luck! 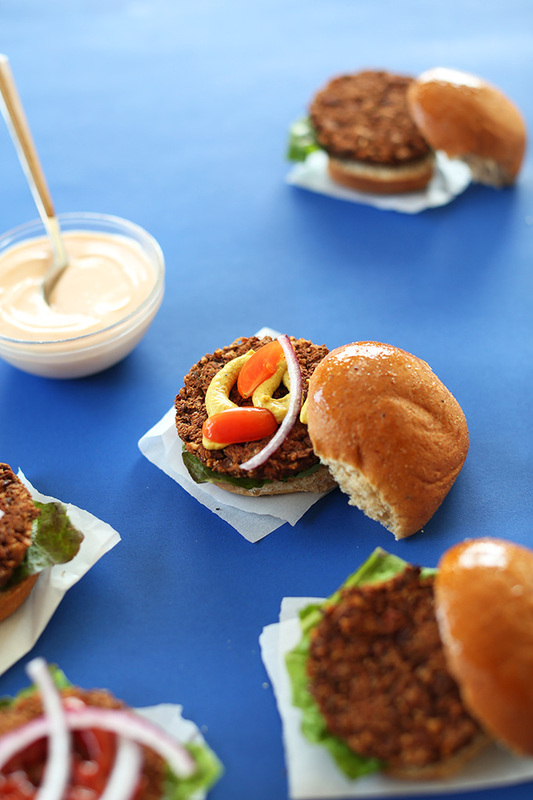 I just made these tonight for the first time and let me say….thank you so much for creating the first veggie burger that was everything I had been dreaming of! Every veggie burger I made until this point was been gummy and tasteless. Keep up the good work! Good flavor but mine were a little crumbley. 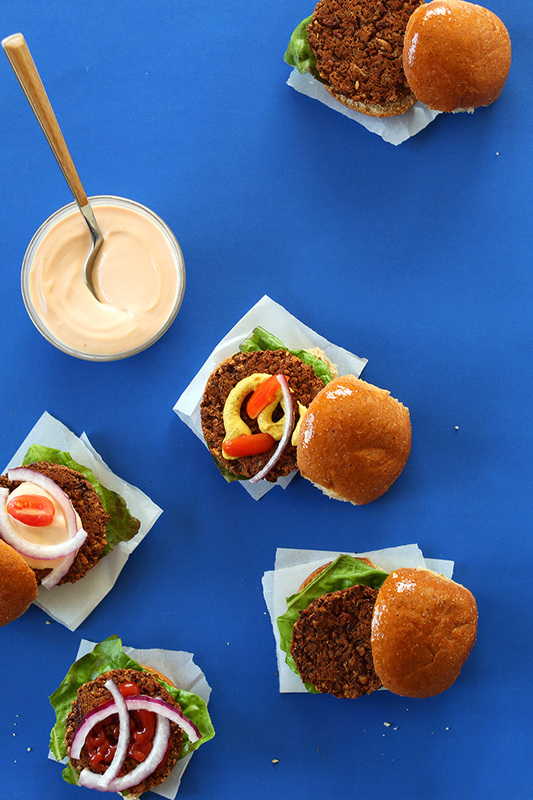 I wanted a flavorful sauce, and found this yogurt sauce— it went perfectly with the veggie burgers! Thank you for the recipe, this is delicious! Mine ended up breaking apart though but I did make them slightly bigger than sliders. Is it the size or did I not use enough walnuts? Hi! I’m sorry to hear that they broke apart! It may have been that you didn’t mash the beans up enough? Better luck next time! What kind of quinoa did you use for this? I bought white quinoa because it’s what I like, but I’m wondering if red quinoa would work better, or if it matters? I used white or tri color – both work. Made these burgers with my daughter last night. They were everything you said they would be! Your recipes are like a breath of fresh air! Thank you! I made these and they were delicious! I used chipotle chili powder for a nice smoky flavor, as well as toasted the walnuts before pulsing them. YUM! Next time, will use an egg or some flax to bind them together well, or maybe just pack them together a little better…kinda fell apart after baking. LOVED the tip about the peanut butter lid and plastic wrap! Made the perfect bun-sized patties! I’m going to be having a BBQ this weekend with a ton of vegan food I’m making for my friends who’ve never had vegan food before, so OF COURSE I IMMEDIATELY thought of your recipes. I was wondering, instead of the worchestershire and steak sauce, would it be okay if I just subbed in BBQ sauce to give it more of a BBQ flavor or do you think that would ruin the flavor of everything? I’m going to be making them on the grill, so I thought that the BBQ sauce might make them hold together a little better – but I’m also afraid it might be too mushy. If you don’t mind letting me know your thoughts I would really appreciate it, thank you! Yesterday I googled simple vegetarian burger and this recipe popped up from my favorite food blog! I changed it up according to what I had on hand. Instead of quinoa I used freeka, black beans and I substituted pecans for walnuts. I used coconut oil instead of olive oil. And I love the idea of shaping the burgers in the jar lid. They were delicious and pretty ! I am a bit disappointed! These burgers looked stunning in the picture. I went out and picked up all of the ingredients so me and a few friends could try the recipe. We tried to follow it exactly as written. The end product was really mushy, the kidney beans dominated the taste, and the burgers fell apart. Now I refer to the burgers we made as “kibble burgers” because they were not much better than dog food. Sigh, as a vegetarian I was really hoping for these to work out. But, based on others comments I guess I’ll have to try again! I was wondering, what is that pink sauce. By the way I love love lobe your site ? I’ve made so many recipes from it..
I’m baking this now, in the oven. Is smelling very good and I tried a bite before baking it’s so delicious. This is by far the best recipe i tried!!!! Simple and delicious! Love this recipe. Just made a batch up now to take to the cottage. I’ve incorporated the flax egg idea and left out the walnuts. Did add little rolled oats to the mixture. Going to parcook them, wrap and freeze them individually. Reheat them on the bbq. Great texture and flavour. Thanks for sharing. These were great and came together very quickly! I cooked quinoa in skillet and used same pan for sautéing after and then the same pan again to finish the burgers up after baking and they were great! Half I added taco seasoning to and we topped with salsa and guacamole and the other half with cumin and then served with hot mustard on toasted pretzel bun sliders! These might be my new go-to veg burgers! Whoop! Thanks for sharing Karley! I liltarley jumped out of my chair and danced after reading this! I just made this today and it was absolutely tasty. I substituted black beans for kidney beans, added garlic, and Serrano peppers for added spice. I uused a few chunks of avocado and a little salsa on my burger while my fiancé put kimchi on his. Hey, we like a lot of flavor clearly! I like that this recipe is very versatile and open for everyone’s interpretation. I really love the recipe and I like the taste, but I think I’ve done something wrong, because as I put them in the oven, they fell apart and wouldn’t stick together. Do you have any idea what I could have done wrong? They are a little fragile. To help with binding you can always add 1-2 Tbsp oil OR a flax egg! You rock, Dana! 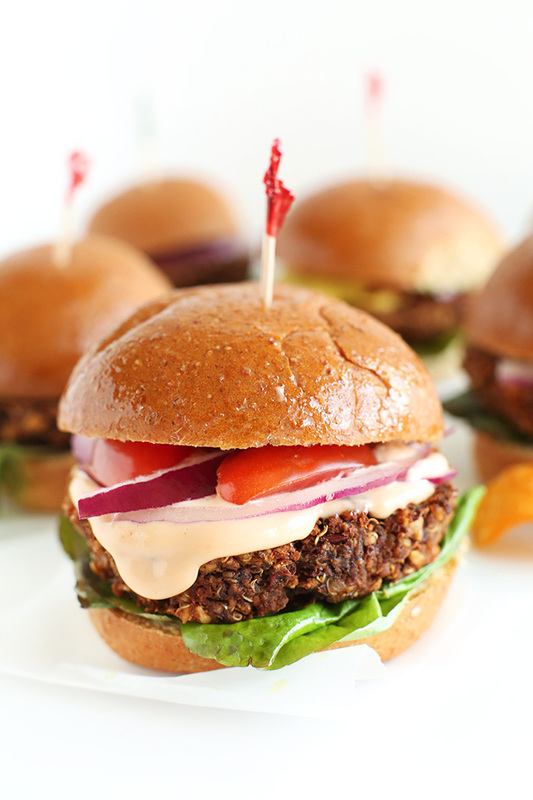 Thank you for posting this recipe because it is the most delicious veggie burger recipe on the planet! I followed the recipe exactly as posted but did add a couple table spoons of fresh lemon juice to just round out the flavors. I can’t wait to make another batch tomorrow and then throw a party, just so my friends can enjoy them too. It’s recipes like this that make it effortless to be a vegan and for that I’m very grateful to you. Thank you again for posting this recipe. I think this is the first comment I’ve ever made but couldn’t help it this time. I love this recipe so much. I have been looking for a good burger recipe and have finally hit the jackpot. I have another batch (my third) ready to go now. This time I used red kidney beans instead of black beans and almonds instead of walnuts. They already taste delicious and they’re not even cooked yet! I love the versatility of this recipe. Last time I added garlic, this time I added garlic, fresh parsley, some smoked paprika and some liquid smoke. I can’t wait to try them cooked! I have also been adding a couple of dessert spoons of psyllium husks and the same amount of water and they stay together brilliantly. Thank you so much. I try different burgers from time to time and wonder why I just didn`t make these again. My favorite burger – texture is perfect and I add both Worcestershire and steak sauce – yum. I made these tonight and they were fantastic. Instead of a full tablespoon of chili powder. I used half a tablespoon with half a tablespoon of cumin. Thank you for another stellar recipe! I just made these, followed the recipe to a t but they came out really really crumbly, I mean like granola crumbly. What do you think I did wrong? Any suggestions to prevent this happening next time?… I really want to make them again since the flavor was great! We ended up eating them like sloppy joes. Hmm, mash your beans a bit more next time? Also, scale back on the nut meal. Hope that helps! I can’t wait to try these but for just two of us this may be alot. Can they be frozen and if so before or after baking? they look so yummy. First off, love your recipes. I’ve tried a few already that were deliciousness incarnated and there’s more on my list! I’m not vegan or vegetarian, but a lot of my friends are and your recipes allow me to accommodate them and not feel like I’m missing out! I haven’t tried the recipe yet because I have a question, who’s would the patties hold up if I threw them on the BBQ? Should I bake and freeze them first, or would they fall apart on the grill? Great question! They will be a little tender on the grill, actually. If you make them a little thicker and are very gentle, it should work. Another tip would be to add a little foil on the grill to keep them from falling through. Otherwise, I’d recommend baking them. Hope that helps! I subbed mushrooms for the same amount of sweet red pepper, sautéd longer , then turned it up to get rid of the extra water from the peppers, (i put them in a food processor w/ onions so it was finer) and it tured out a-okay . PS: made these right after making your cinnamon rolls :) YUM! Lovely! Glad you enjoyed these, Jillian! Hope the cinnamon rolls went swimmingly, too! Made these last night – SO yummy! My husband and I are trying to eat more vegan so this was a great recipe! The vegan-thing is a little harder for him but he loved these! We both agreed they’re WAY better than any frozen veggie burgers and have a fraction of the amount of sodium which is awesome. Mine were a little crumbly but I’m not exact on measurements so I’ll follow those a little more closely next time. Awesome recipe (like everything else we’ve tried on here)! Thanks, Melissa! Glad you enjoyed these. If you bake them instead of saute them, that should help with the crumbly issue. Also, mashing your beans a little more will help, too. Hope that helps! Hi, I followed this recipe to the letter, except for halving it and subbing the walnut for crushed sunflower seeds. They are still cooking so I can’t vouch for the taste, but I just flipped them and 3 out 4 patties broke apart into crumbly messes. I’m sure they will still be tasty but i was really looking for that patty, burger like consistency and they are just too crumbly and fragile. Any ideas why? Julie, it may be that you didn’t mash the beans quite enough to keep them holding together. By the way, I made them tonight (sans processor) and we LOVED them! Perfect texture and flavor, and they held up great! Thanks! I used the food processor to process the mushrooms, which really wasn’t necessary. You can just use a fork and a bowl! Hi I am very new to your website, as of today, and am so impressed that, when I saw your recipe, I could print it straight away instead of copying and pasting into Word and then printing. I love this recipe and will be trying it next week. It looks fab. hey Dana! 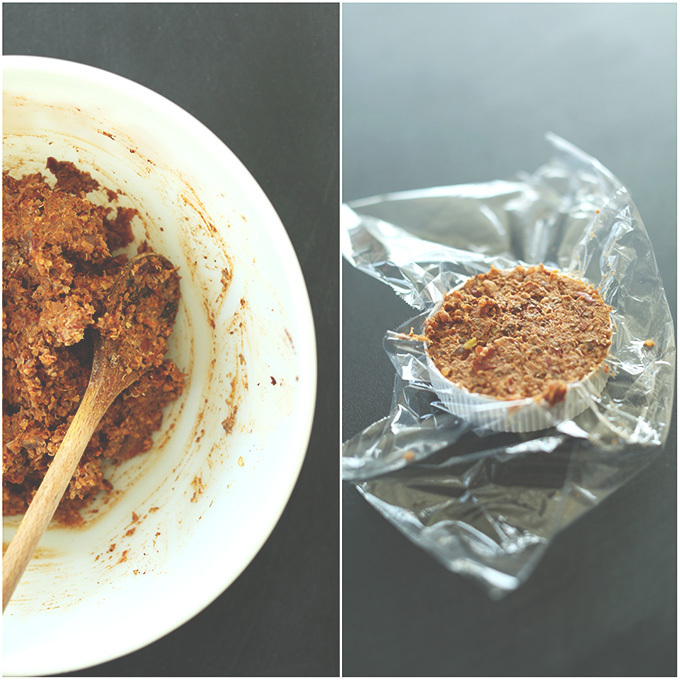 :-) I and my bf tried making tofu burgers way back and stumbling upon this today makes me giddy – will share this recipe of yours to him. I have also wandered around your website and I am totally hooked. Consider me a follower from now on. Also, I’d be very happy to feature you soon as one of the top minimalist websites at Greenfudge.org. I’ll write you again as soon as the article is up. I have these in the oven right now. Smells terrific. The kids ate the walnuts so I only had about half what was called for but I’m sure they’ll be fine. Thank you. Love your recipes! oh shoot. you are awesome! Just wondering, how did you make the sauce presented on the burger? Looks scrumptious and I want to try. It can be made with vegan mayo + ketchup! That’s it! I tried these out with a few substitutions yesterday (ground cashew instead of walnuts, black beans instead of kidney) and wanted to let you know that not only are they the best veggie burgers I’ve made, but probably the best I’ve ever had. Thank you! Best review eveerrrrr! Thanks, friend! So glad you enjoyed them. They’re kind of my fave, too! Also, sharing a portion of your comment on Twitter. Hope that’s cool with you! Amaze! I never really eat sliders because I’ve never seen a vegetarian version, so I guess time to make them myself! I’ve really been wanting to try a recipe like this, but I have been too intimidated. This recipe looks so tasty, it’s healthy, and I’m fairly confident that I could pull it off…without totally screwing it up. I’m darn near drooling over the pictures…wow these look so delicious! I’m going to give this a shot! Thank you so much for sharing! With summer grilling season coming up soon, it’ll be nice to have a stack of these in the freezer to pull out for parties. I strongly dislike all the chemicals in the frozen veggie burgers! I luv you so much right now its causing me actual physical pain! These look amazing, I wouldn’t have know they were veg from the first pic. Made these today – delicious. Froze extras for visitors this weekend. Good job! Lovely! Thanks for sharing, Judeen! This recipe looks so delicious, I will have to try them out at some point! Your blog has been a huge cooking inspiration to me and I have just recently purchased your E-book for food photography and am in love! Thank you. Oh good! Thanks for sharing, Molly. Glad you’ve been enjoying the recipes and e-course! Hope you learn lots. Cheers! These look so great! We made a slider recipe with mushrooms and it was super delicious but I’ve been looking for one that will give me some added protein! Oh man, I think I forgot that veggie burgers actually CAN be fast and easy. This recipe looks perfect, I cannot wait to try them! Gotta love simplicity, especially when it looks like this!! the bright cobalt background is so fun! WOW-these look seriously delicious! I’m always looking for a quick and easy veggie burger recipe to try, so i’m definitely adding this one to my list! The photos are so gorgeous too!! Thanks for the kind words! Let me know if you give them a go. 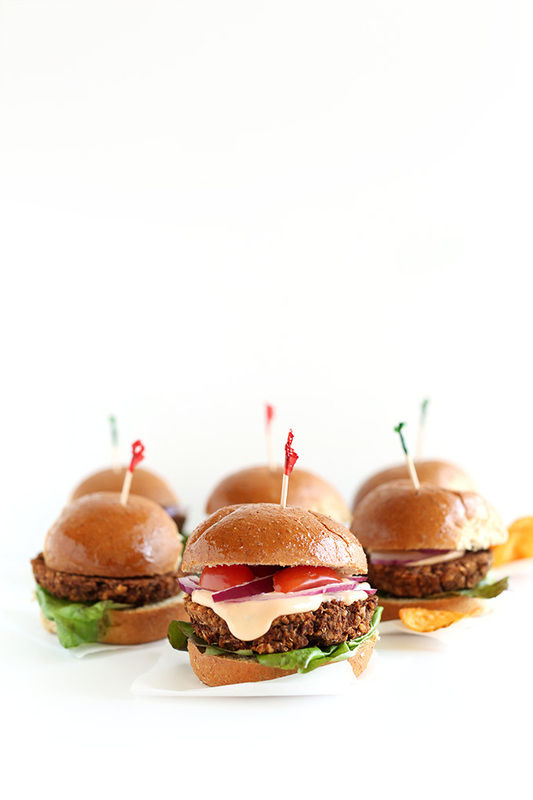 Omg I JUST saw these mushroom, onion walnut burgers over at An Unrefined Vegan last night, haha and commented there! Guess mushrooms and walnuts are on everybody’s mind. :) Unfortunately, I don’t eat mushrooms, but they sure look tasty and I like that you added quinoa! They are super cute as sliders too! Thank you! Yeah, I know some people aren’t crazy about mushrooms, but they are quite subtle in this recipe. this is the kind of recipe i am looking for because i try making it and it ends up being mushy. i will have to try these ASAP. Yeah! No mushy burgers here. You control how crispy they are with how long you bake them. Hope you enjoy! Love the trick for forming the patties! Do you think walnuts are essential, or could one sub another type of nut? I think you could sub any type of nut, as long as you crush them a bit finer. Almonds, for instance, are much harder to chew that walnuts, so they’ll need to be broken down a bit more. 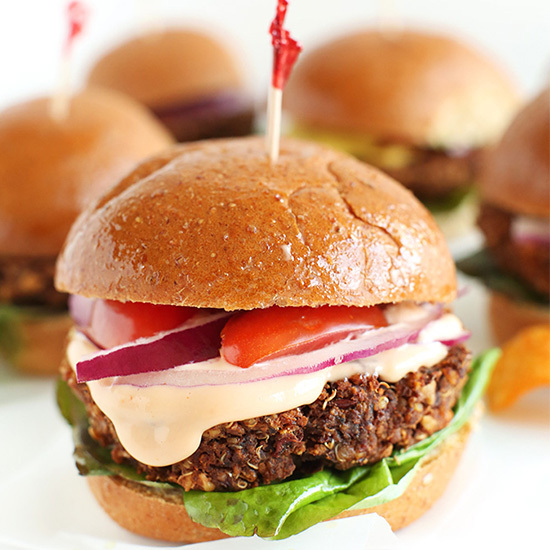 I have the same qualms when it comes to veggie burgers, so I’m super duper excited to try these! Love how simple the ingredients are, too. Cheers to 7 ingredients! These guys sound and look YUMMY. 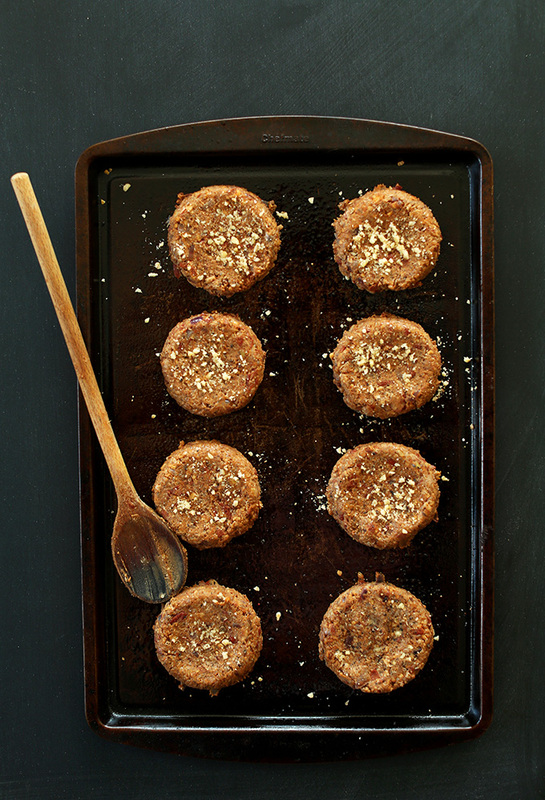 first off….i want to thank you for these wonderful recipes and gorgeous photos!! thanks sooooooo much and i look forward to each new post! Thanks Kerry! So glad you’ve enjoyed the recipes thus far. Love your recipes. Any nut free suggestions for this, for nut allergies? Hmm, it will definitely affect the flavor, but you could likely compensate the walnuts with additional beans and quinoa. Love this recipe! I’ve been meaning to try veggie burgers at some point. I like that you can bake these in the oven as well as brown them in a skillet. Pinned! I’ve been waiting for a long time for a recipe like this! Thanks tons, and I will be getting to these sliders shortly. Do you have any reference to a home made type mayo (maybe one that can be customizable in flavors…) that could go with these? I don’t really eat mayo as I’m more of a ketchup/mustard girl. But, if I were going to try one I’d probably make a cashew cream sauce with a bit more sweetness to it to mock the flavor of mayo. Hope that helps! Otherwise, silken tofu would be a good base. Veganaise has a great line of products as well and is a great healthy alternative to mayo – Mayo, bbq, chipotle, aoli, etc. I always use one of these on my veggie burgers, wraps, and really any type of sandwich! I love a good, hearty veggie burger! Making a sturdy, but not dry one is practically an art form. I’ll have to give this recipe a try! Dana, you a girl after my heart! I am so a burger and fries girl. For some reason people think that since I am a vegetarian I just want to eat salads. This sounds super yummy. Could I use some cooked millet instead of the quinoa? Thank you for sharing your recipe and have a sweet day. Shannon, thanks! I think you could use millet instead of quinoa. Just know that it may taste a bit different since millet can tend to be a bit more bitter than quinoa. Hope that helps!